← A Quiet Monday in Floyd? Every year, I try to plant some vegetables in a spot where the deer cannot get to them. In this part of Virginia, that means putting up a ten-foot-high fence like Thomas Jefferson did at Monticello or setting up a planter on a high deck. 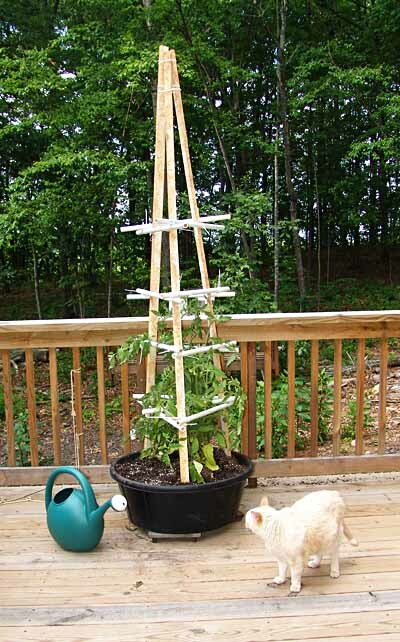 I have chosen to take the high road and finally planted two tomato plants in this improvised deck planter yesterday with a 7 foot trellis structure. The tripod and crossbars may look like overkill, but experience has shown me that anything less will involve a lot of tricky add-ons late in the summer when the vines are heavy with tomatoes. I put in two plants this year. One is a Supersonic and the other is a Big Girl. My selection process was simplicity itself. I bought the two biggest and healthiest plants at Slaughter’s Tree Farm just south of Floyd. I was not able to get the planter I wanted at first so the tomato plants have been sitting on the back deck for about 3 weeks. 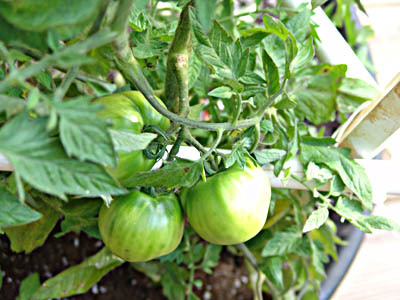 They came with thumb-sized tomatoes already set on them and the tomatoes have grown to two inches in diameter while waiting for the planter. The planter is a rubber container used to water livestock. I drilled a hole in the side and installed a drain pipe that hangs out over the side of the deck. This keeps water from accumulating in the tub and carries the drain water safely away from the decking. The improvised planter sits on three oiled cedar platforms I designed just for this purpose. They ensure that there is airflow under the planter at all times. Here you can see one of them under a much smaller plant. 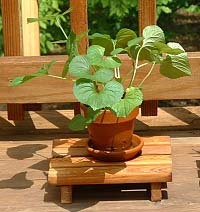 Pots and planters on a wooden deck can really wreak havoc on the decking if water is allowed to accumulate under them. Refinishing a deck after planter water has eaten into the decking can be an expensive proposition. This will probably be the limit of my gardening this year. We are approximately 2800 feet above sea level and our growing season is weeks behind nearby Roanoke because of the altitude difference. I will post updates as the tomatoes ripen. I’ve got a 48″ tall picket fence around my 20×40′ garden and that’s enough to keep the deer out. You’d need a 10′ deer fence if you had acres of plantings (i.e., vineyard) but a simple garden needs only a simple garden fence. Congratulations on your short-legged deer! Up here in Floyd we have deer that clear four foot high fences with ease. In Lake Monticello near Charlottesville, we had deer that would walk right up the steps to your deck if you weren’t home so they could help themselves to the salad bar. That’s why I plant tomatoes on a high deck. 8 foot fences or electrified fences seemed like too much trouble this year. Let me know if the 48″ fence keeps them out all summer.